The American Library in Paris Writer-in-Residence program was created in 2018 to foster cultural and artistic exchange between prominent writers and the Library community. The Library will select a writer for a short-term residency that will provide a unique opportunity for engagement. This residency is made possible through the generous support of The de Groot Foundation. The Writer-in-Residence receives a $3,000 stipend. The award, to be spent at the author’s discretion, is designed to cover travel to Paris, accommodation, and expenses associated with the residency. Be present in Paris during the entire period of the residency. Conduct at least one workshop on writing or a mutually agreed upon topic. Appropriately acknowledge the Library and the Writer-in-Residence program in publications and print media related to the residency. 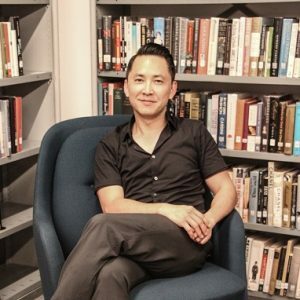 Viet Thanh Nguyen (July 2018) is the Aerol Arnold Chair of English and Professor of English, American Studies and Ethnicity, and Comparative Literature at the University of Southern California. Nguyen’s debut novel The Sympathizer was published in 2015 and won the 2016 Pulitzer Prize for Fiction, as well as the Center for Fiction First Novel Prize and the Carnegie Medal for Excellence in Fiction from the American Library Association. He is also the author of a collection of short stories in 2017 entitled The Refugees as well as a work of non-fiction Nothing Ever Dies: Vietnam and the Memory of War in 2016. In addition to teaching and writing, Nguyen also serves as culture critic-at-large for The Los Angeles Times and is co-director of the Diasporic Vietnamese Artists Network (DVAN) which stages film and literary festivals and events that center around the voices of Vietnamese in the diaspora. Nguyen will talk about his edited collection of essays The Displaced: Refugee Writers on Refugee Lives on Wednesday 4 July at 19h30. He will also lead two masterclass workshops on Sunday 8 July (full) and 15 July at 15h00.